Our 360 Mailing Solution incorporates all the services of IMS into one slick package, helping you to introduce efficiencies into your business. Improve your performance with our end-to-end solution; allowing you and your staff to focus on growing your business. 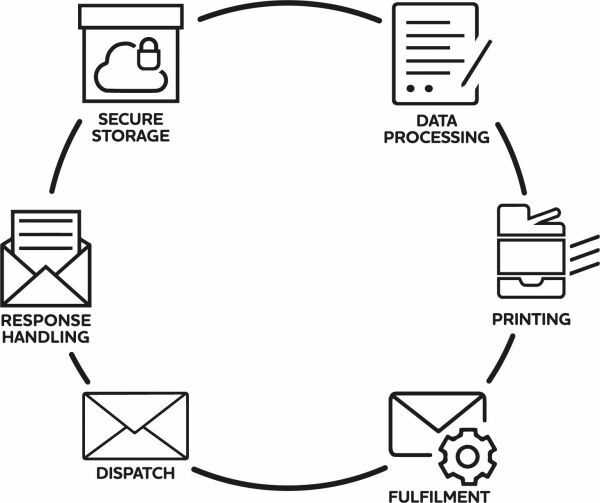 You can rely on our expertise to take care of all your data processing, printing, fulﬁlment, mailing, response handling, scanning and document management processes. Your designated Account Manager will work with you to understand your requirements and ensure our processes are tailored to your every need. IMS offers a suite of services via its 360 Mailing Solution which support businesses in meeting their statutory obligations and corporate objectives. 360 Mailing Solution is designed to offer businesses a secure and outsourced document management process, allowing them to focus on essential tasks whilst their print, fulfilment, mailing response handling, and document management processes are managed by IMS. This makes 360 Mailing Solution perfect if your business needs to undertake a direct mail campaign, from printing personalised communications - anything from 10 letters out to a full scale campaign - to scanning responses, 360 Mailing Solution offers the complete package. All IMS services carry the highest international standards for Data Security (ISO 27001), Quality Management (ISO 9001) and Evidential Weight and Legal Admissibility of Electronic Information (BS 10008). This makes IMS the only mail house on the Isle of Man, Jersey or Guernsey to hold these accreditations, so you can be assured that your data is secure. As a part of the Isle of Man Post Office, with direct access to the mail stream, they have total control when it enters the global mail stream. This enables targeting of specific dates to provide maximum impact and returns for businesses. 360 Mailing Solution was the service selected by the Isle of Man Government for the completion of the 2016 Interim Census. The Census forms were delivered by the Isle of Man Post Office to approximately 42,000 occupied households. IMS dealt with the processing and data capture from the returned forms and provided live data to the Cabinet Office on a daily basis using its end to end mailing system. You can read about the success of this project in the case study below. Our team of experts will help you to develop a bespoke communication solution designed to optimise the way your connect with your audience. Click through our pages for a run down of all our services or speak to one of our team today.